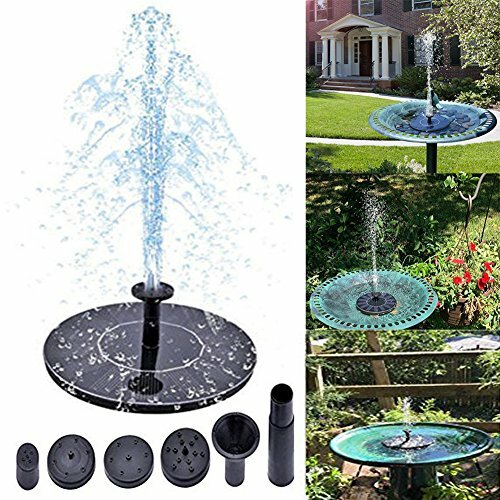 FashionSun Solar Powered Bird Bath Fountain Pump,2018 Upgraded Floating Solar Panel Fountain Water Pumps Kit Outdoor Birdbath Water Fountain Pump for Garden Decoration,Patio, Pool and Pond | Fountain City Art Ctr. Visual impact enjoyment: you can see different fountains, amazing, novel, innovative, it just needs enough sunlight and water, works in cloudy or when sunlight becomes weak. Multi-Application: Perfect for bird bath, fish tank, small pond, pool, garden, water circulation for oxygen, let your garden and yard look so funny decorated by the solar water pump.Moving water attracts birds and discourages mosquitoes from breeding. Note and Suggestion:Make sure enough water in the bird bath so that the pump can keep working. Or SolarPanels will be burned, both please clean the pump on regular basis to get the pump get blocked with dirt., too dirty water can shorten the life of the fountain, affect the normal work. If you have any questions about this product by FashionSun, contact us by completing and submitting the form below. If you are looking for a specif part number, please include it with your message.